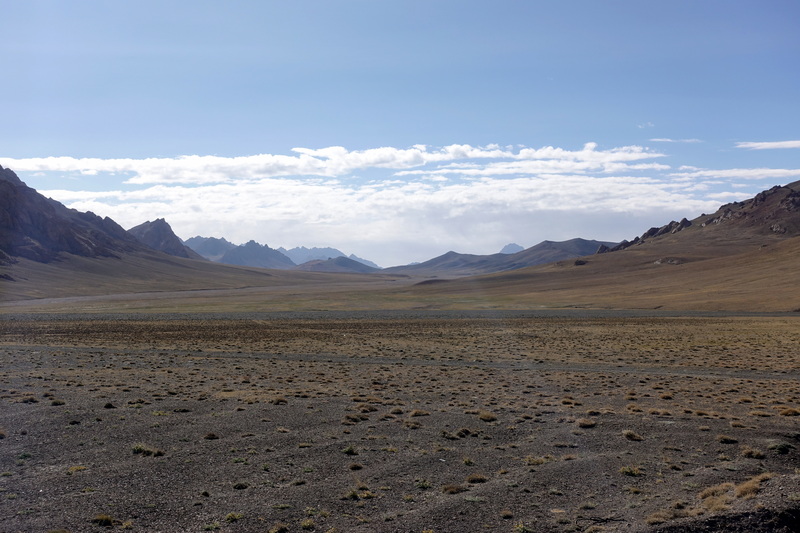 Once in Murghab, Cédric and I decided to take a day off to rest from the week’s ride. 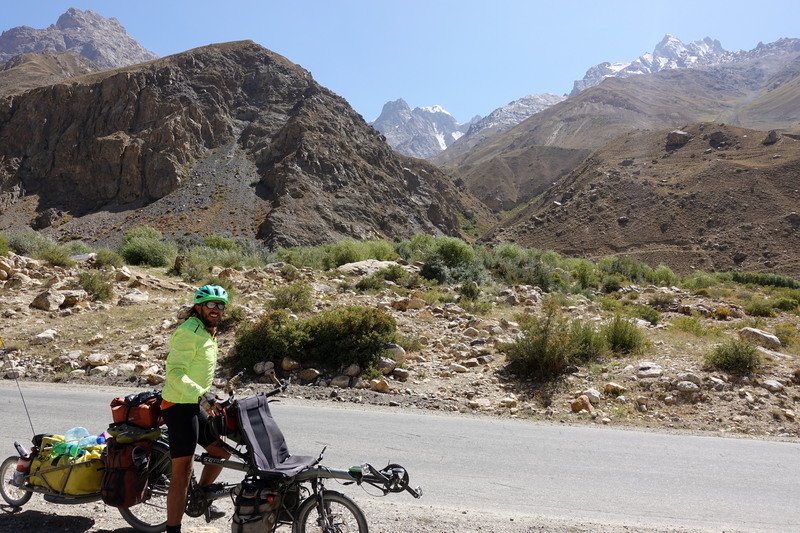 We had been cycling up from 900m in Osh to 4655m on the Akbaital-Pass, with multiple smaller passes and endless smaller ascents on unpaved roads (often more strenuous than the highest pass), so our bodies were calling for a full day of laziness. We enjoyed a slow morning sitting in the sunny front room and reading news and books. Around lunch time, we figured that it was time to go out and explore some of the town and pick up food supplies for the onward journey. 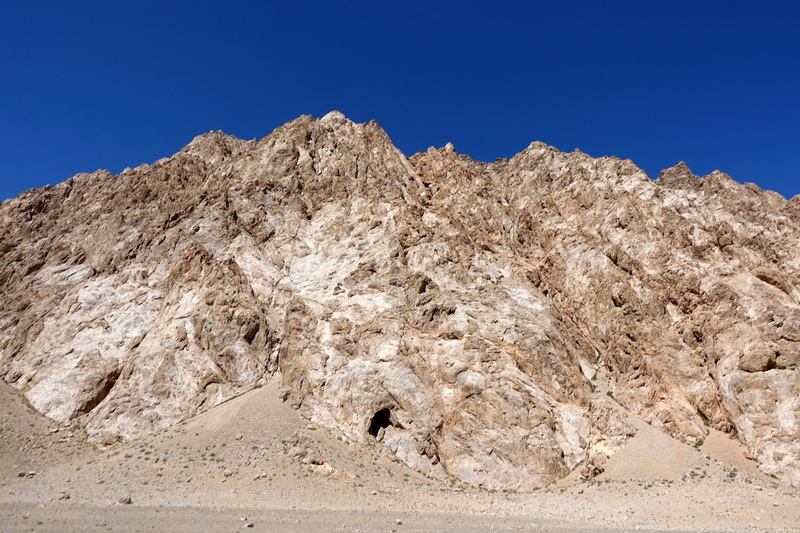 For being located in such a remote area of Tajikistan, Murghab has a surprising number of residents (ca. 4000) and whitewashed homes filling the area between the two main streets. There is a feeling of being on the extreme edge of the planet, a town locked by borders with China and Afghanistan, surrounded by a few summits at 7000m on the horizon, countless mountains at over 5000m often unclimbed and even without any name, only reachable through passes at altitudes that would be the highest points of most of the countries around the world. 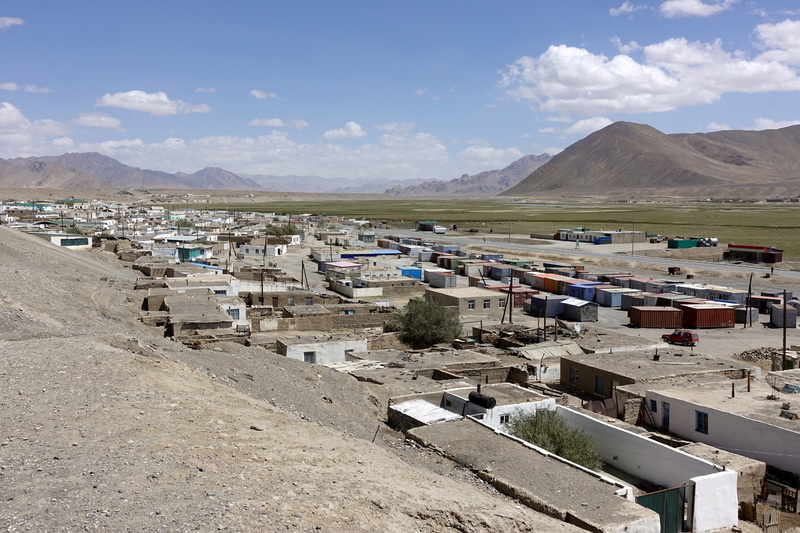 But Murghab is basically the only town in a radius of over 100km, so also the only place where it is possible to get (or hope to get) anything not self-made, and thus creates a bit of activity. The proximity with China also brings some military activity and a bit of life in the town (although not having any phoneline or electricity, we were wondering what Tajikistan’s plan would be to counter a Chinese invasion…the solution appears to be immediately contacting the Russian army). A view of our homestay. Don’t let these powerlines fool you, there hasn’t been electricity here in a few years. 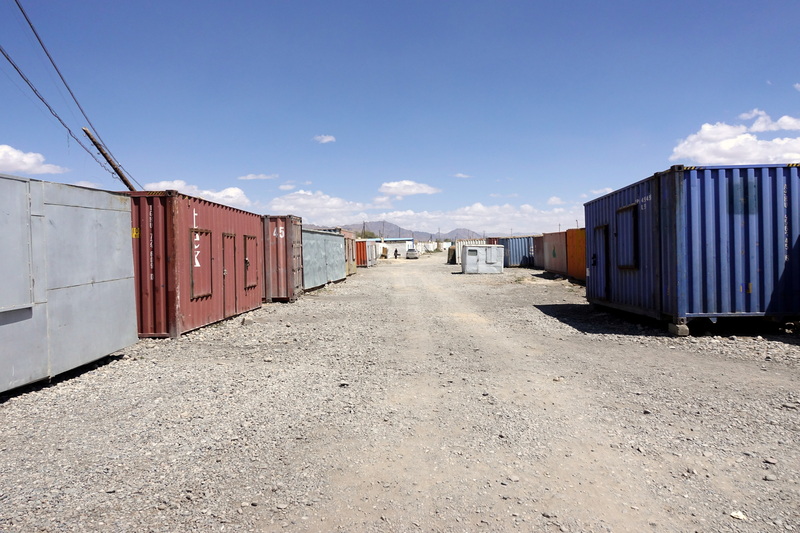 Much like the towns in Kyrgyzstan, Murghab is also home to a small container bazaar where a few items can be found (such as SIM cards and car parts). It’s also very obvious that the town prospers from the influx of tourists in the summer months due to the number of guesthouses and men driving around town asking foreigners if they needed a guide (we were asked twice within an hour, not much but given the number of people you meet per hour the percentage is high). 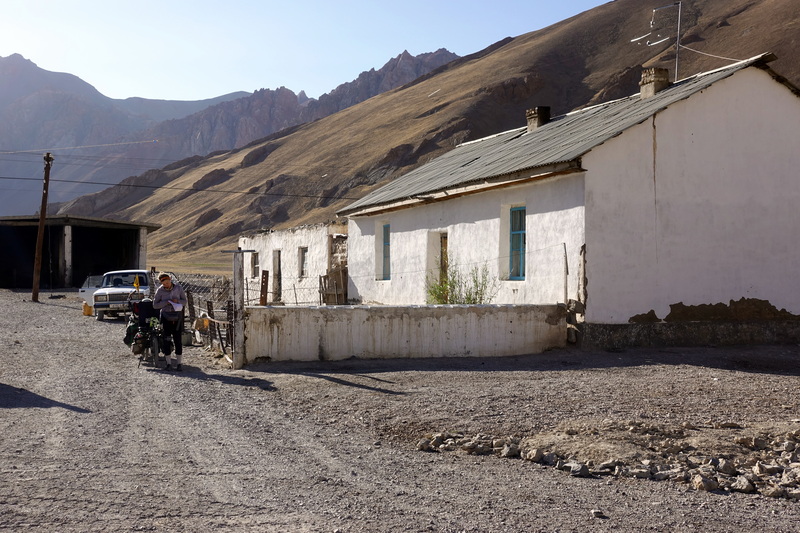 After our short stroll around Murghab and lunch at a local restaurant, we returned to our guesthouse in the afternoon, still planning to focus on our lazy-day. 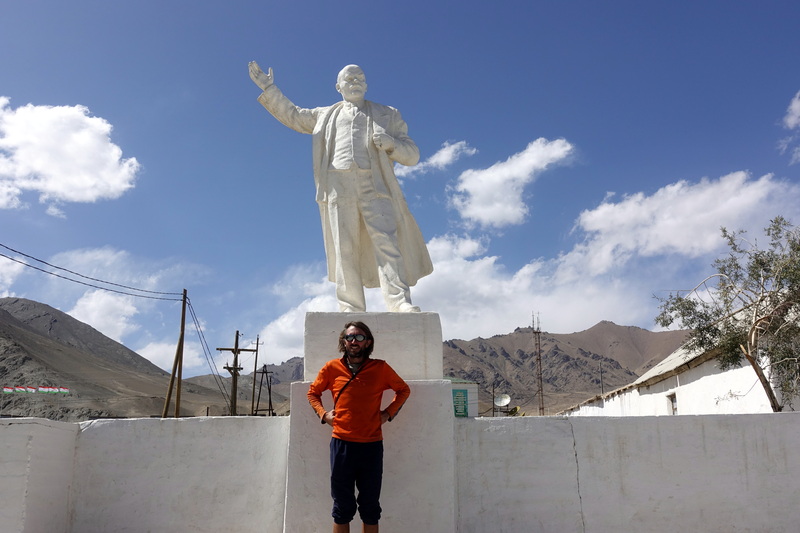 We spotted yet another Lenin! We wondered (and did not find the answer) how much the Soviet Union could have been influential in a place that far from Moscow. 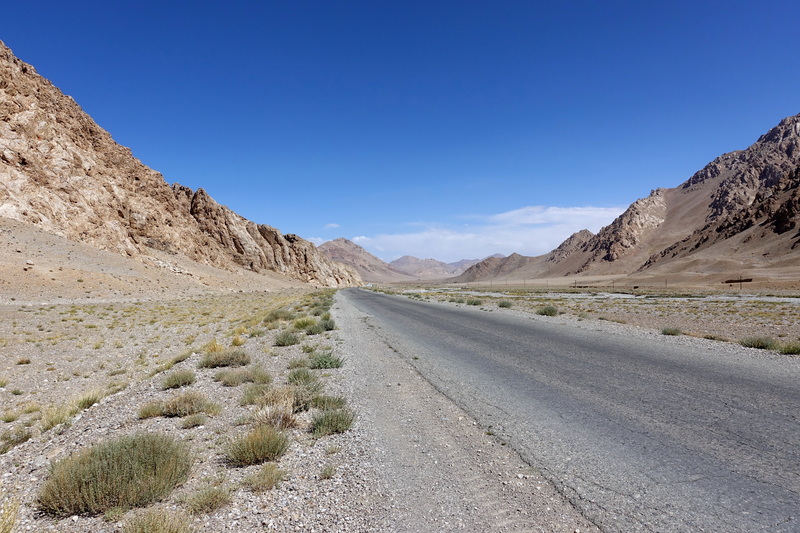 What’s for certain is that the Pamir highway was built to expand the Soviet union south…and help accessing Afghanistan during the Soviet invasion. 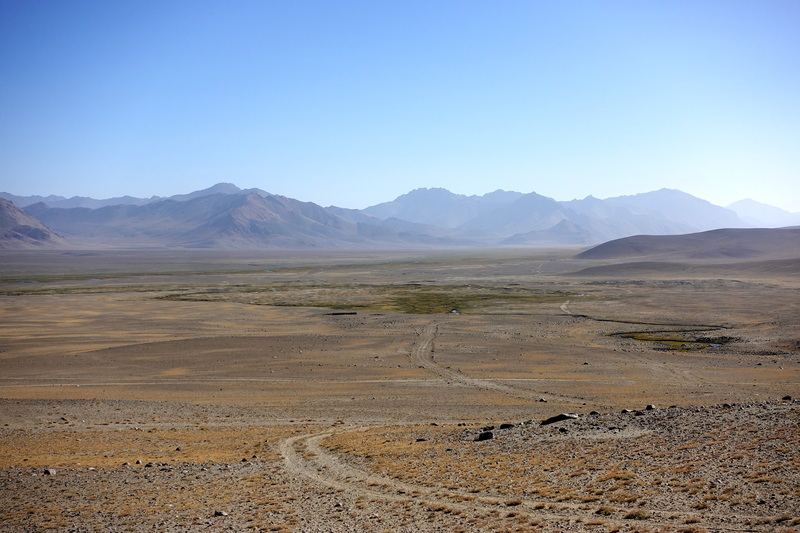 Out into the valley west of Murghab. 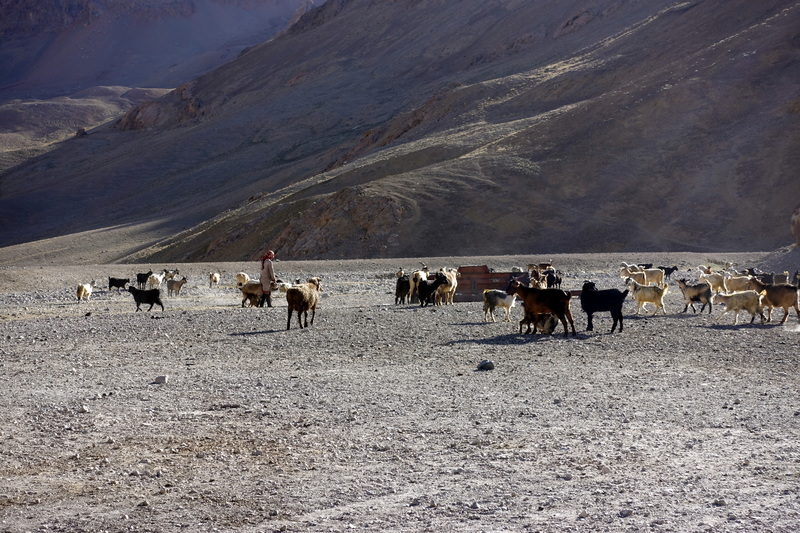 Unlike many comments from travellers, and although the region is desertic, it was fairly easy to get clean water. Still cycling… the wind however got stronger and stronger and we had to push a few kilometers later! 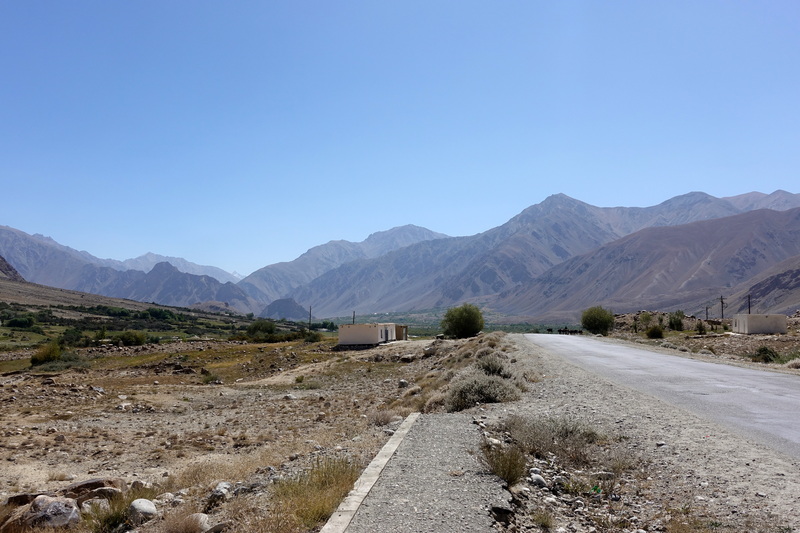 So, in the mid-morning, we left Murghab and set off heading west on the M41. As we rode, we watched the landscapes continuously transform all around us. 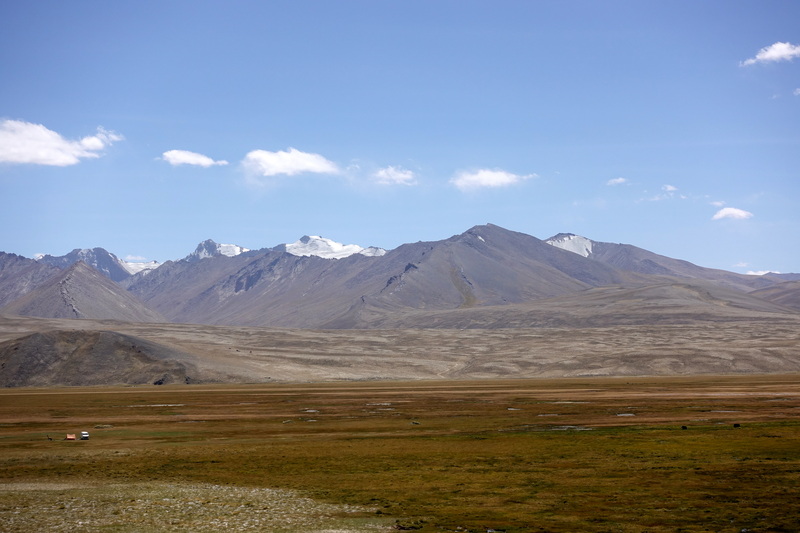 Sometimes, we had the feeling as through we could have been in a national park in the Western U.S., southern Morocco, or Patagonia – with the mountains and rock faces looming in the distance, only we were high up at 4000m. 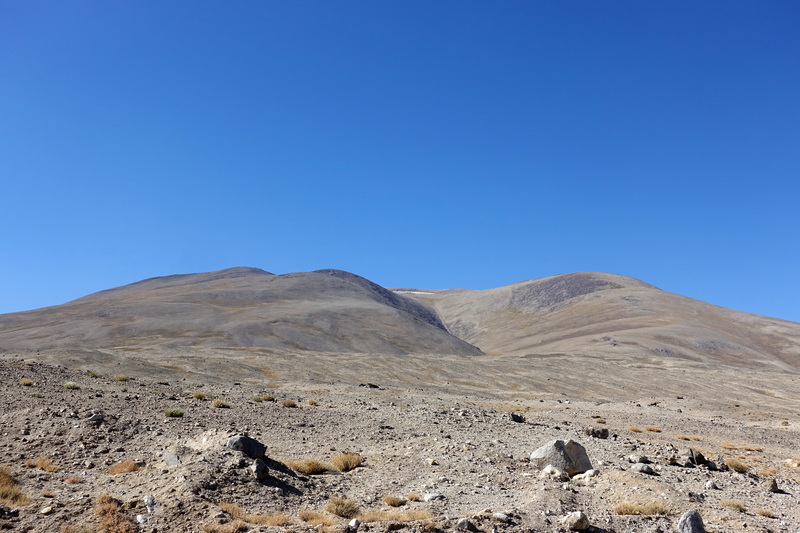 At that time, we were fairly well acclimatized to the altitude (at least concerning altitude sickness, but we luckily did not have any symptoms whatsoever), except that at 4000m literally anything feels exhausting! The heart is constantly pumping stronger and the pace of breathing higher, all the time. As the day progressed, we started facing our relentless challenge for the next few days: wind. Around noon, when we stopped for lunch, we could only eat standing up near the Pino since we were too afraid that a strong gust would blow over the bike. 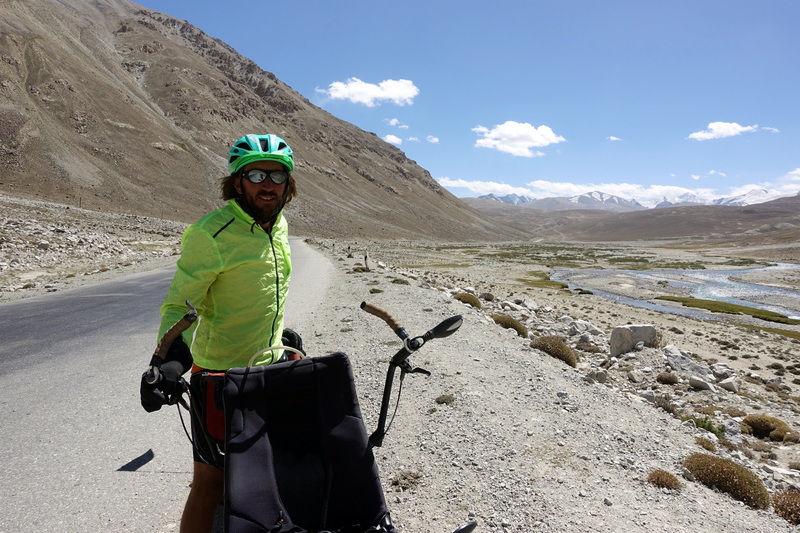 We had a goal set for camping after a small pass, but as we continued cycling, the headwinds became stronger, to the point where Cédric and I needed to push the bike because we were no longer stable. At lunch we had planned to cycle the remaining 20km in about 2h, but 4km later given our average speed it looked like it was still going to be 2h – at 8km/h, again 4km later it seemed that we would still need 2h more – at 6km/h, the same after 4km – at 4km/h, and with an insane headwind getting ever stronger, at 3km/h we had no choice but stop pedaling, we just could not control the bike anymore! Just as we stopped to contemplate where to camp for the night (these wide valleys offer no trees and no protection from the wind), being a little in distress because there was no way our tent would resist the gusts, we noticed a small group of buildings in the distance and figured that we could ask to pitch our tent near the house. 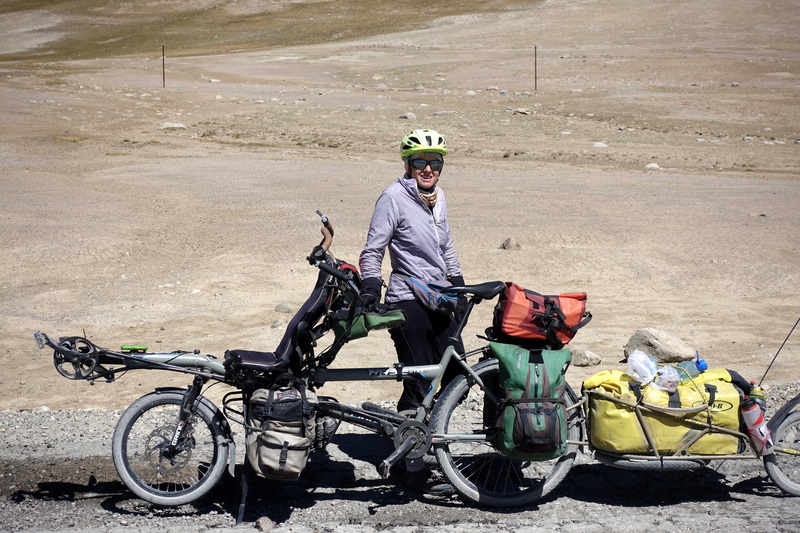 As we approached, still pushing the bike, we made a few gestures inquiring about pitching a tent, the matriarch responded asking whether we wanted a homestay. Beat up from the wind, we responded yes without hesitation. 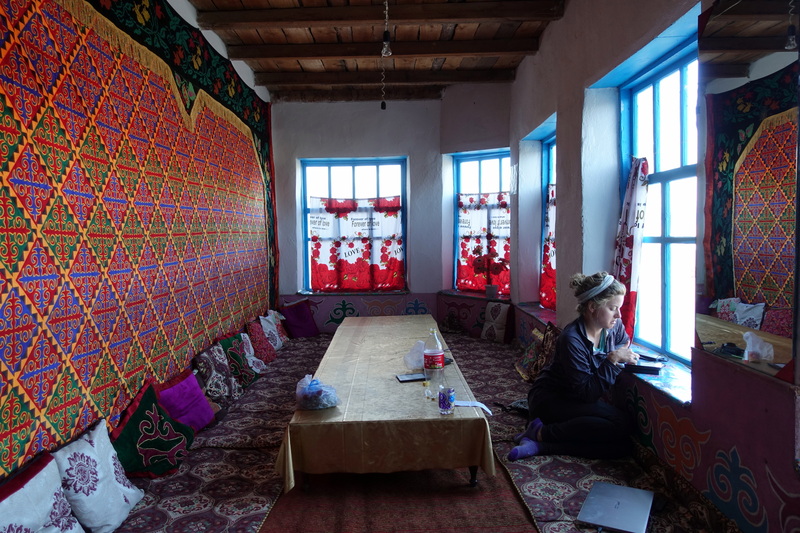 The remaining bits of the afternoon and evening, we sat in the warm, carpeted room and drank tea with yak yogurt, yak butter, bread, and plov (a form of pilaf, the official dish of the Pamirs and Central Asia). Whenever we went outside to the bathroom (an outhouse), we were happy that we didn’t need to struggle with the wind and cold. 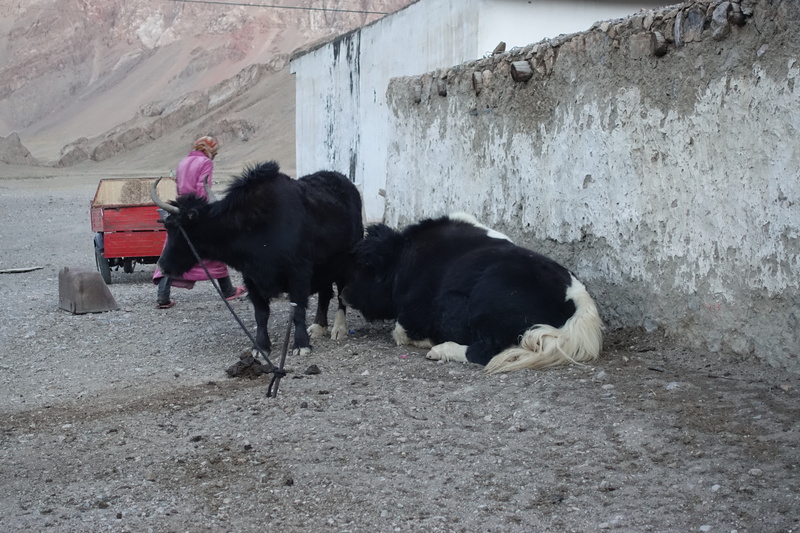 We also watched in awe of the family as they herded and milked their goats and yaks before it became too cold outside. Before we went to sleep, Cédric and I formed a game plan: to wakeup with the sunrise and stop cycling around midday, to avoid the worst of the wind. 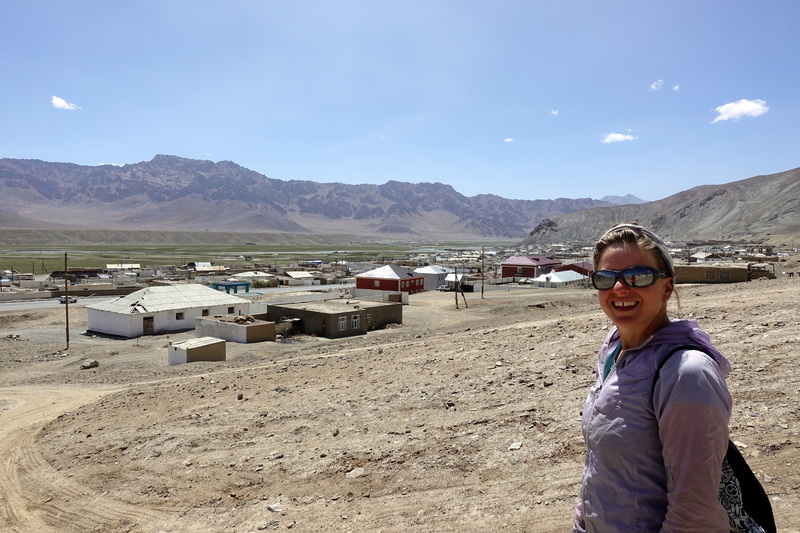 We got amazed that people manage to live in such harsh conditions, and at the same time offer so much hospitality to perfectly unknown travelers with whom they have so little in common. The usual communication is nearly impossible yet understanding each other is easy. Being in that hostile environment get people to endure things together and helping each other become vital. There’s no real protection from the wind here. Also note how dense the traffic is: about 10 cars/trucks per day, and usually 2 cyclists every second day! True to our plan, we woke before the sun got over the mountains and were surprised to see that half of the family was already awake and outside tending to the livestock. 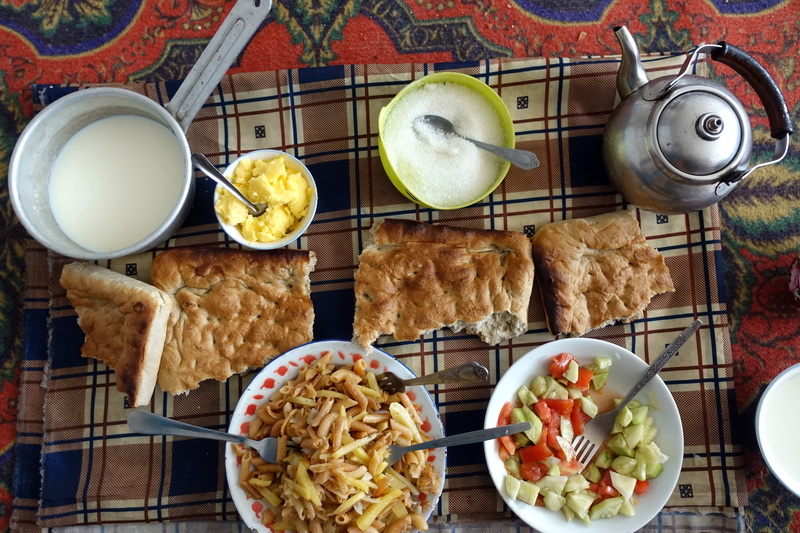 We had a quick breakfast of tea, bread, and butter before we packed our things and left. 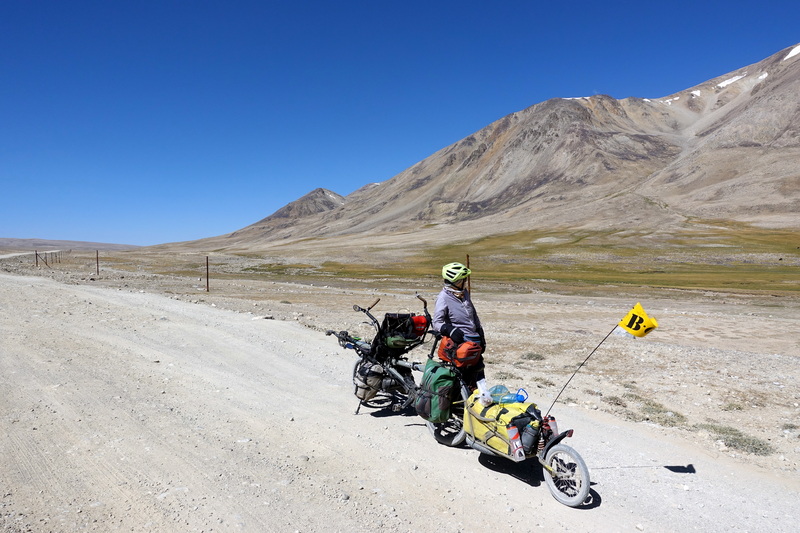 We immediately noticed how much the wind was slowing us down the day before… the previous afternoon, we were inching along at 5km/h, but now we were at least three times as fast cycling up the remaining kms of the pass. As we continued riding in the morning, we mostly had the road to ourselves and were sometimes accompanied by families of marmots whistling in the distance. Much like the day before, the gentle winds grew stronger by midday (including a few scary dust devils) and we were glad to get off the bike at a guesthouse in Alichur in the early afternoon. 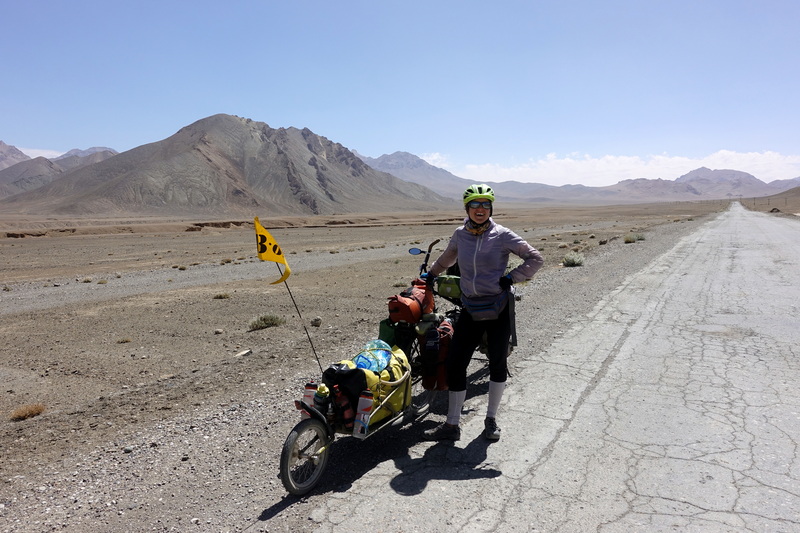 The rest of the day was spent sitting in the sun and drinking tea in our room while reading – we were already exhausted from the day’s slow ride west. In the evening, Cédric was feeling unwell and had the symptoms of some type of foodborne illness, combined with exhaustion, so we went to bed early in hopes that it would go away by morning. Some of the kids were already out tending to the goats when we woke up before sunrise: we set the goal to leave at 7am to bike mostly the morning and avoid (as much as possible) the insane wind. Getting ready to hit the road. 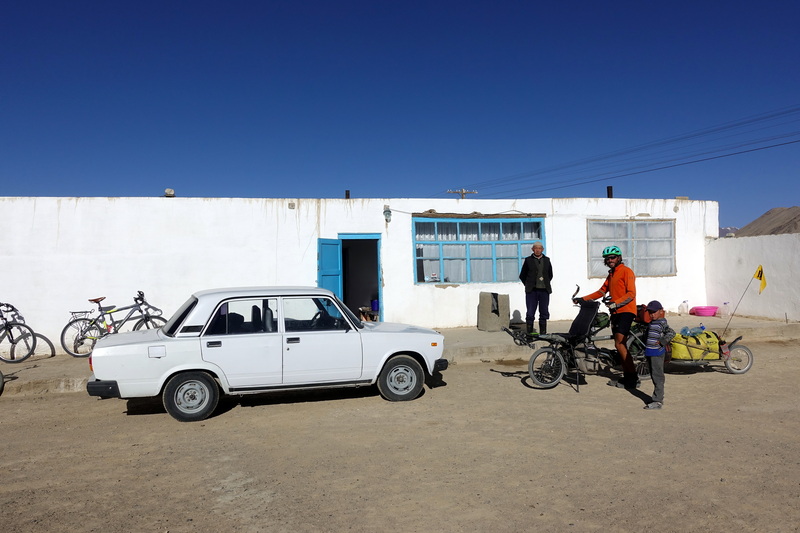 It does not look like, but this family lives in a farm at over 4000m. Incredible way of life, in simplicity, but an immense generosity. 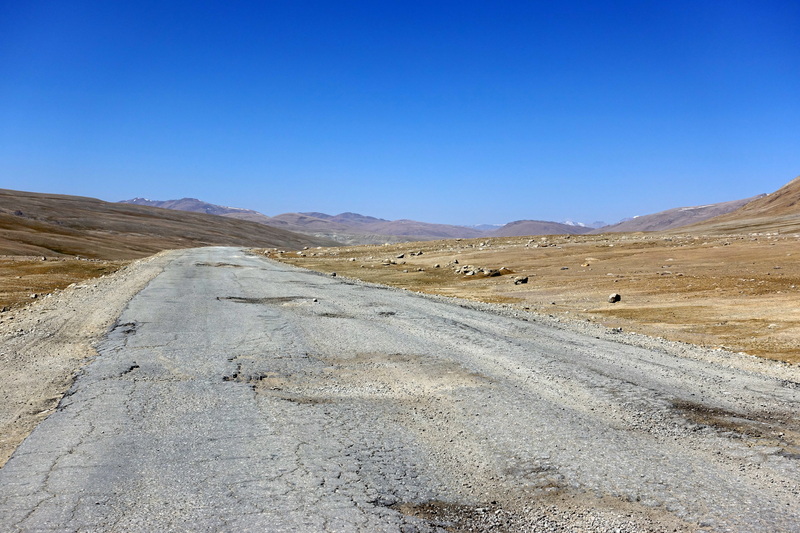 The road up to one of the easiest 4000m pass – don’t let the sky fool you, it was still quite cold and windy. Plus think half the amount of oxygen you are breathing right now! Those waves are created by large floods in spring when the winter snow melts. In summer, not much water left though. Indeed, after some fever chills during the night Cédric was feeling better in the morning so we were ready to make a little headway down the Pamir Highway. As we were packing our things onto the bike, we watched some of the guesthouse’s family members slaughter a few sheep out next to the courtyard. As I watched them slice the neck of the sheep, I told Cédric that this might be the first time that I saw someone kill an animal – and we both were amazed that sheep are so passive even while being bled. Once we got out onto the road, we realized how cold it had been the night before- all the village’s small streams and ponds were covered with a thin sheet of ice. It also wasn’t long before we decided to put on an extra layer and our winter gloves to help manage with the cold winds. 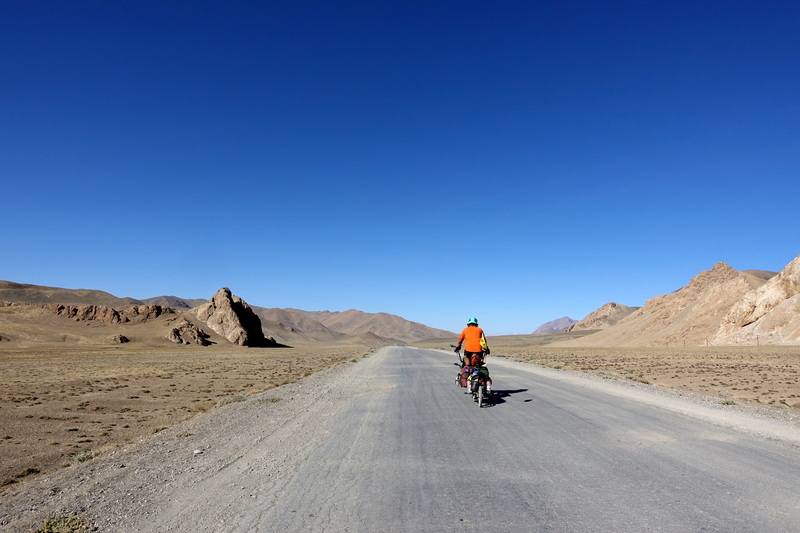 Like the previous morning, we had the road just to ourselves for a few hours as we cycled past some salt lakes and took pictures of the moonlike scenery. At one point, a metal clamp that held one of tubes in place for the front chain snapped, but that was quickly resolved with a zip-tie. 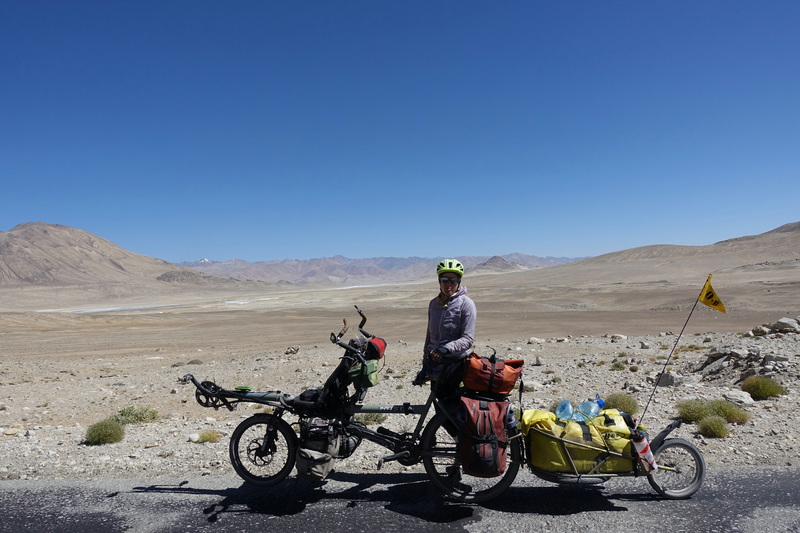 Here, if any major bike malfunctions happened, waiting for a ride could take hours, with the likelihood that the vehicle would have no room left – so we must rely exclusively on ourselves. 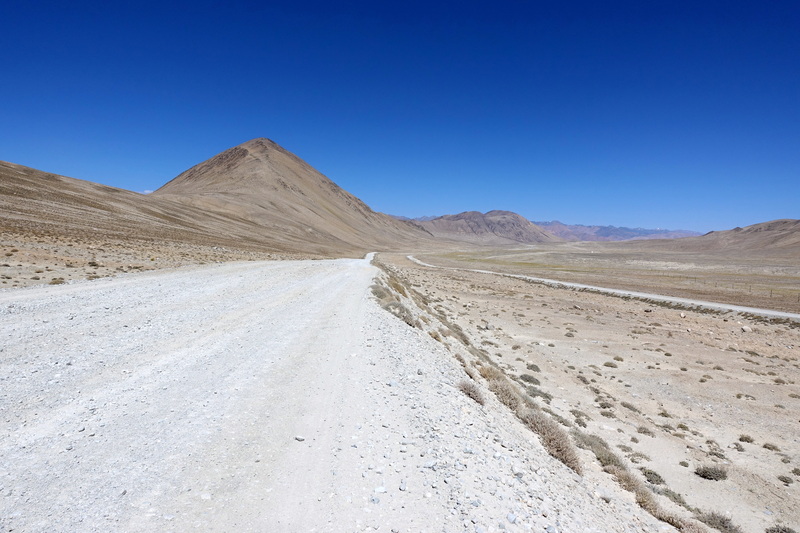 As we rode up to the second ‘pass,’ the winds progressively became stronger and the road deteriorated to gravel- which made the ride slower and slower. About 45 kilometers down the road from Alichur, we saw two young kids run out from a farm marked ‘unofficial homestay’ on our map. They excitedly asked if we wanted tea and in return we made gestures for sleeping and they became even more excited at the prospect of new friends for the remaining part of the day. 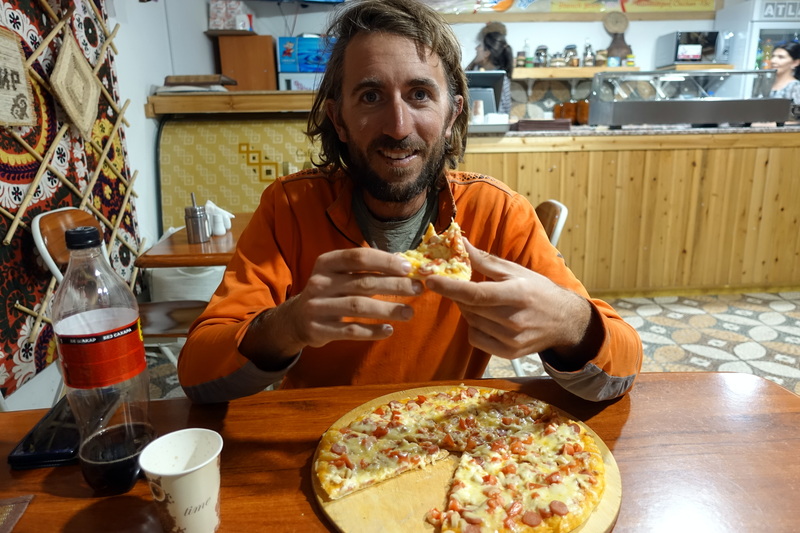 Once Cédric and I brought our things indoors, we were greeted with a bowl of soup, butter, kefir, and hot tea – perfect for recovering from the lashing we got outside. 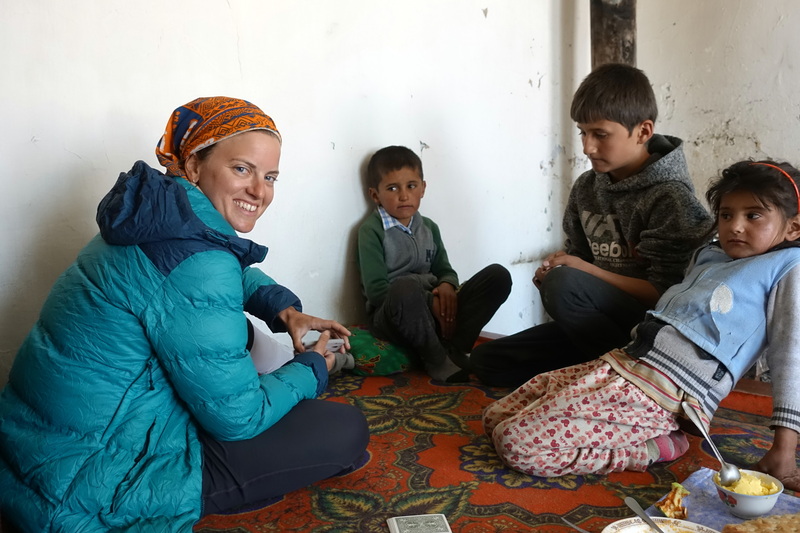 We spent the rest of the day playing cards (with the family’s three kids, too) and sitting near the stove which was heated with cow dung. No intention to get out of the house and being sand-blasted before the night! If you look closely, Cassie has her buff covering most of her face to protect it from getting chapped in the wind! A marmot! 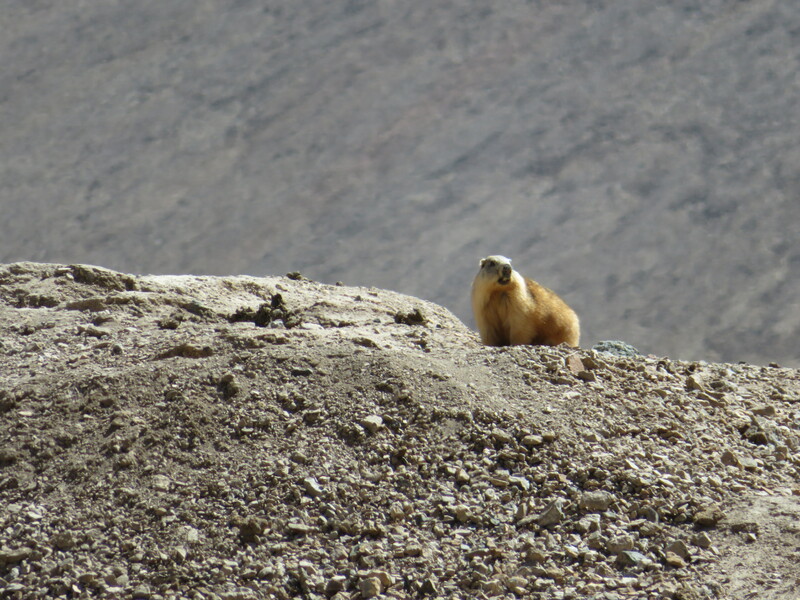 These little fatties were the only wildlife we saw at 4000 m. But they are everywhere! 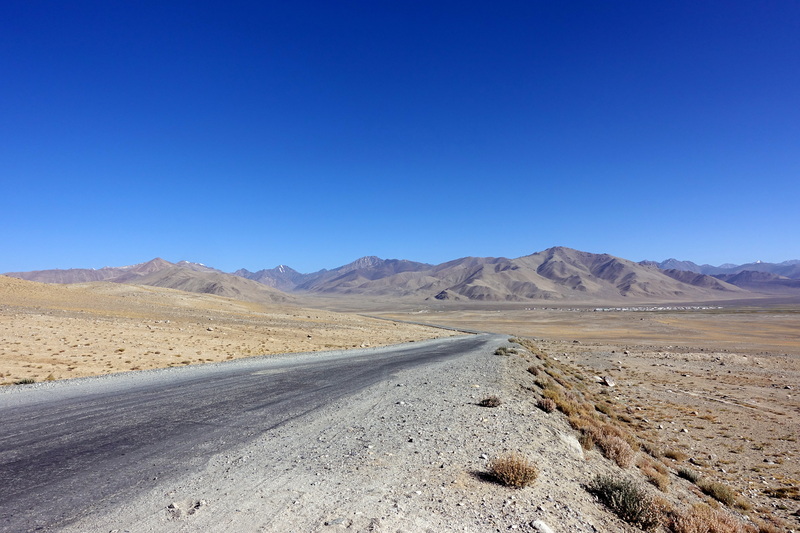 The next morning, we woke up early once again and set off down the gravel highway road for the remaining 20 kilometers of the highway at 4000 meters. 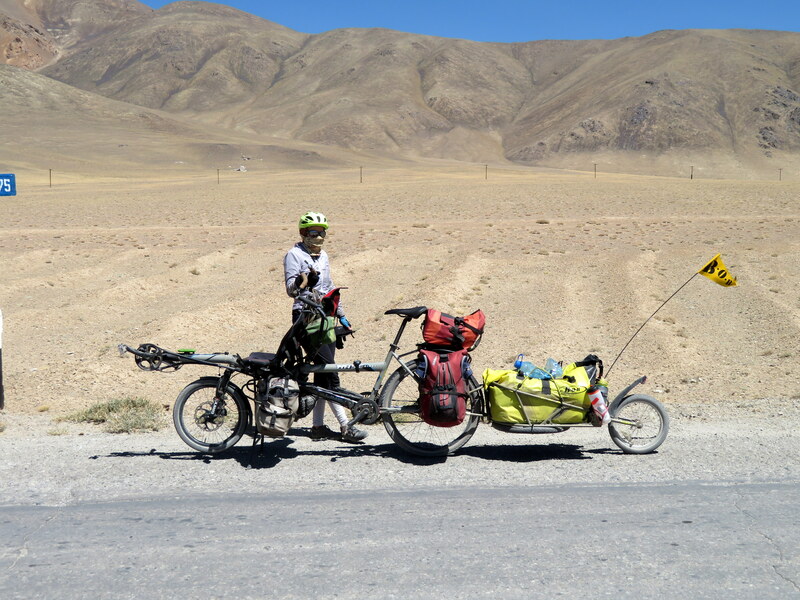 For the first 5 kilometers, we inadvertently ‘took’ the family’s dog with us– it seemed to prefer our petting to the kids’ stones and kicks, so it was happy to follow the slow-moving tandem. At some point, we handed the dog off to a shepherd down the road and hoped that it made its way back to the family. 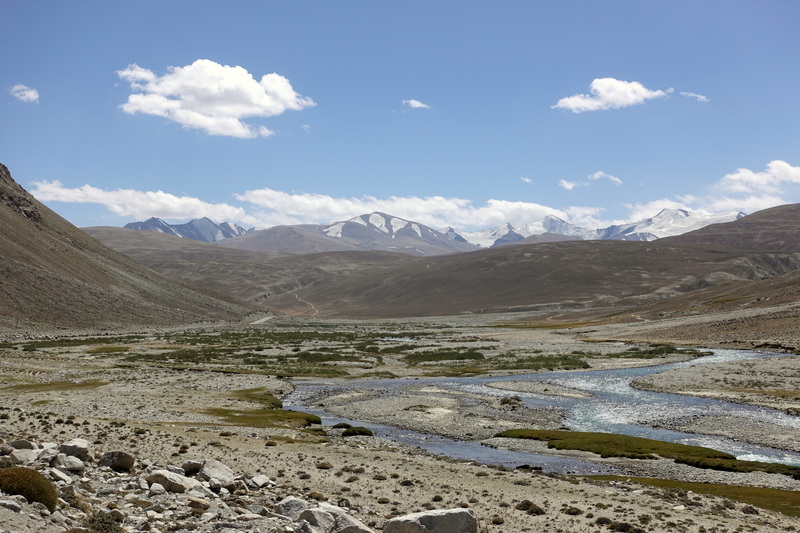 Around midday, we finally reached our last pass and started the descent towards the city of Khorog. After meeting a few passing cyclists and exchanging details from our respective last few days, we decided to stay at the sanitorium in Jelondy, an old Soviet-era spa that also serves as a hotel. Compared to the homestays and guesthouses from the past week, this place (which was surprisingly full, given its location) had rooms with beds and showers. 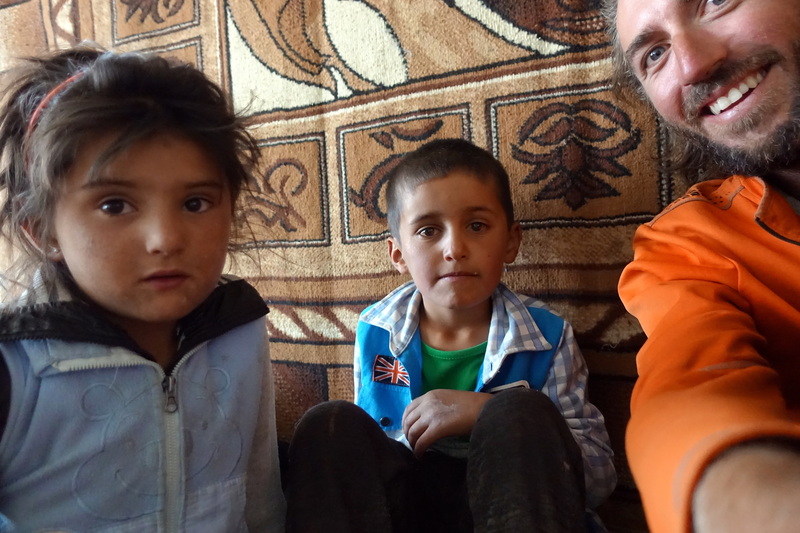 (In most homes in Tajikistan, people sleep on thin mattresses on the floor, which are picked up and stowed away each day; we only found Western-style beds in hotels). The ‘spa’ was hot spring-fed pool in an eerie room that looked like it was taken out of a horror movie with its broken tiles and mildewy cement ceilings, after entering through a metal door that could have been taken from a nuclear-submarine (although nuclear submarines in Tajikistan may require an apocalyptic deluge). There was a bit of the ‘’Grand Budapest Hotel’’ feeling to that hotel, where time had stopped for a half-century. At this point, I was showing symptoms of something festering in my stomach, so I was happy to rest for the remaining part of the day. 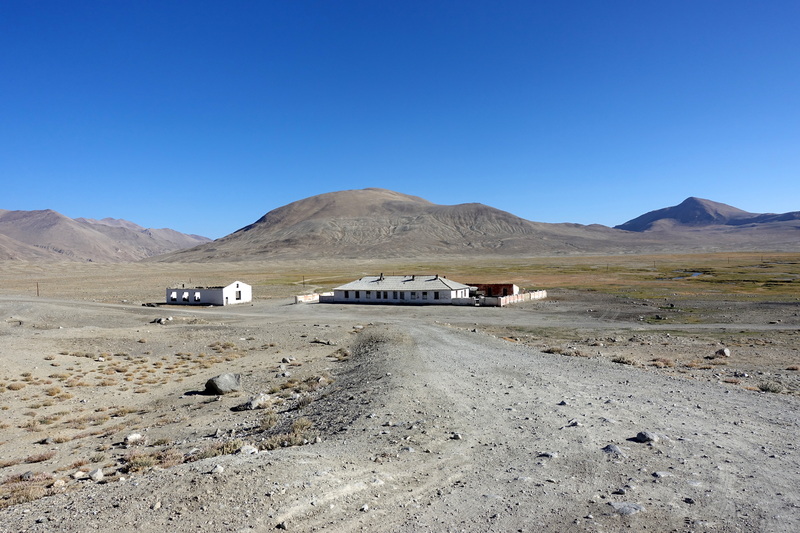 The loneliest homestay. 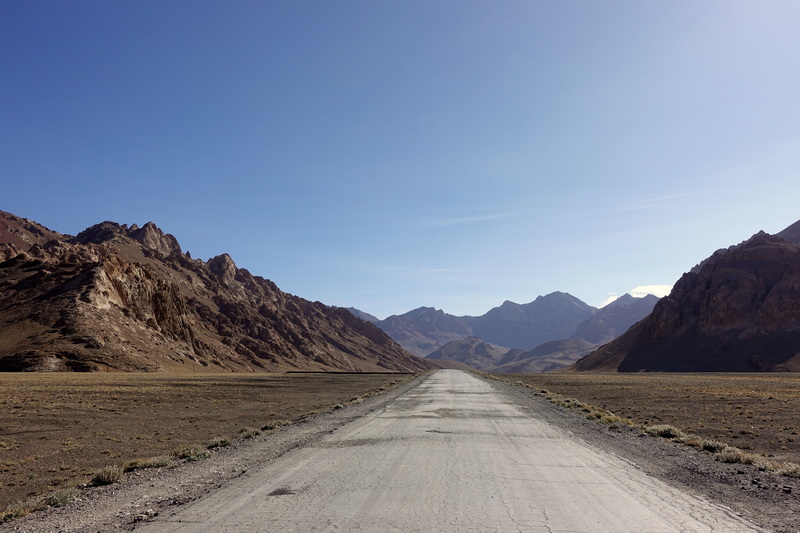 Imagine your closest neighbor to be 25km away (an hour driving, 3 hours cycling), and having to go through a 4000m pass wherever direction you decide you go! Just a few kilometers down from the pass and there’s water again! 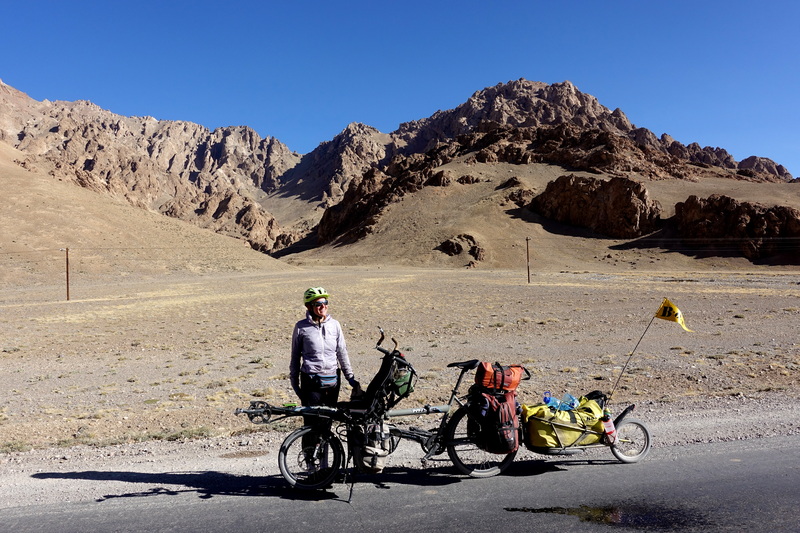 The next morning, still not feeling the greatest, Cédric and I decided to cycle all the way to Khorog. 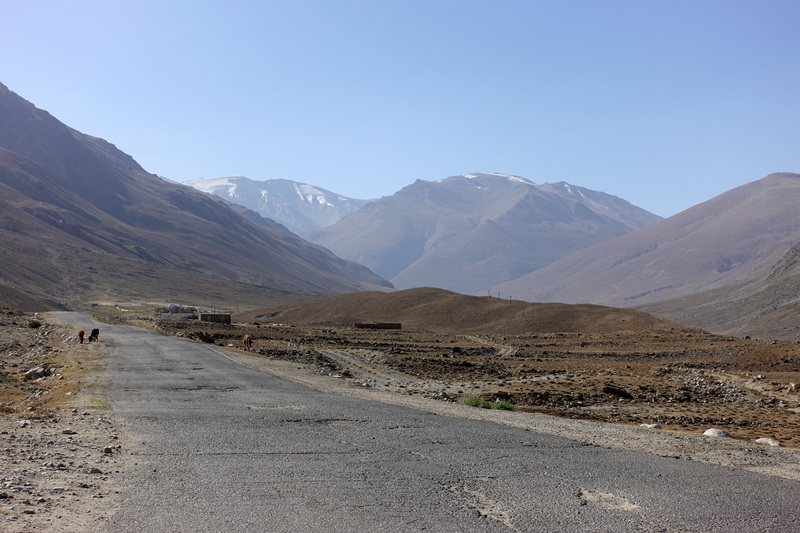 It was a 2000-meter descent over nearly 130 kilometers, so we naïvely thought that the day would be easy (especially since all the cyclists told us that the asphalt was in good condition). 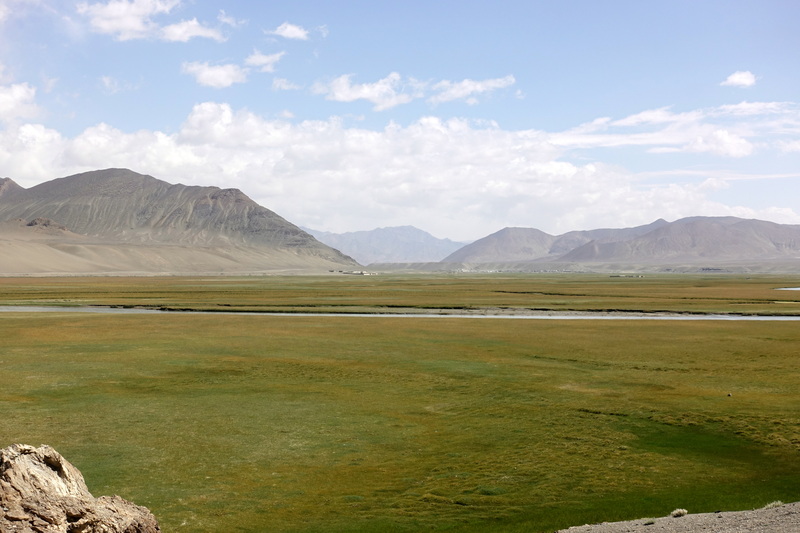 We started our journey out of Jelondy and quickly noticed that trees and grass was starting to appear in the valley – something that we hadn’t seen since we entered Tajikistan. Soon, there were more and more homes and small villages filling up the valley. 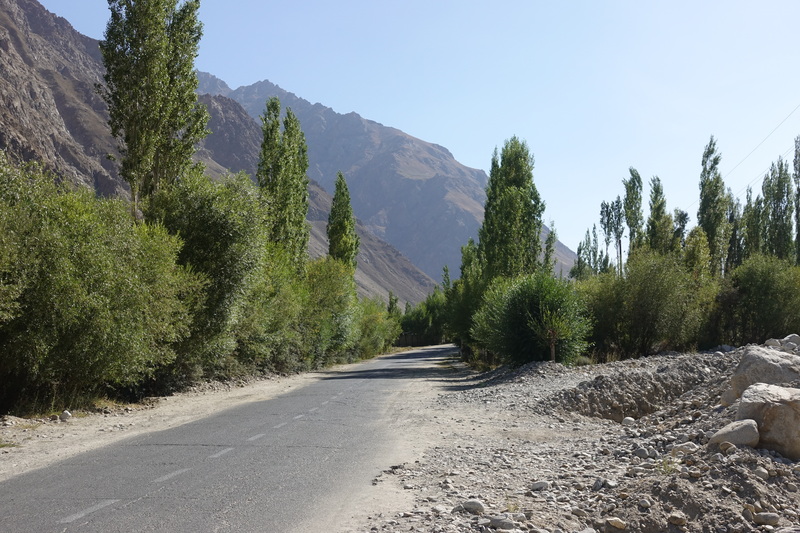 Compared to the Pamir Highway at 4000 meters, this area felt like a small Eden because everyone had bountiful gardens and fruit trees. However, as we were riding down the valley, the roads weren’t exactly ‘smooth,’ requiring us to navigate huge potholes and dirt tracks. Before long, as we were going through a village we rode over small deviation in the road and then heard CRRRRHHH, CRRRHHHHH, CRRRHHHH (the sound of metal grinding on asphalt). Immediately, we knew that something happened to the trailer and then as we saw the BOB Ibex wheel shooting out in front of us, it was obvious: the other axle of the trailer had broken. I jumped off the bike to chase the wheel and Cédric started walking up and down the road looking for missing parts. 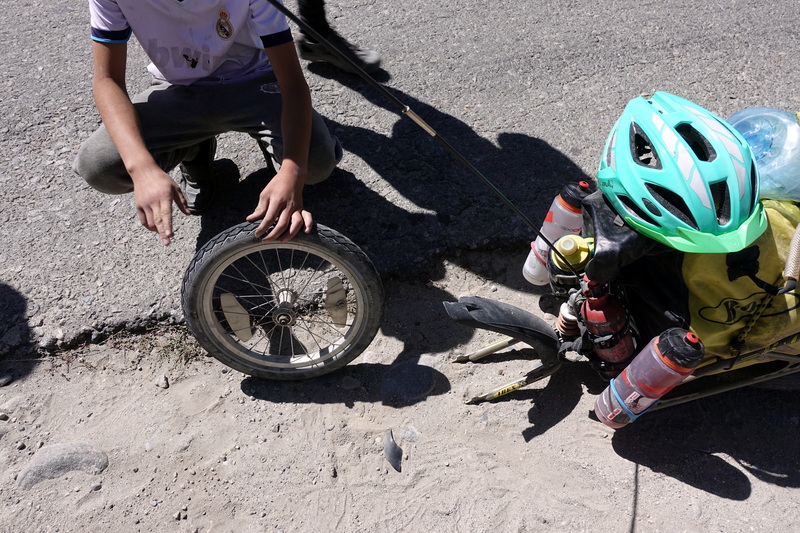 Just a few short minutes after it seemed like our Pamir journey had ended, a few local guys in the field (one of which spoke decent English) told us that they could try to repair the wheel. As Cédric continued searching the roadside for the missing axle nut (I was sitting off to the side trying to manage a bad stomach ache), one guy took the axle to look for spare parts in his shop. In about 15 minutes, he returned with a few nuts and a hand-drilled washer, which held the wheel in place. Thankful, we shared a pack of cigarettes with the guys (we don’t smoke, but men here always ask if you have cigarettes, so we bought a pack in Kyrgyzstan just to be gift-ready to offer people) and continued down the road. No proper axle-nut? No problem! WIth a pair of pliers and a few spare parts, we were road-ready in 30 minutes. A short while later, I asked Cédric to pull over so I could finally relieve myself from what’s been bothering my stomach and only made it a few steps before my breakfast hit the road. As I finished and looked up, I saw Cédric and a 7-year-old girl casually watching me and chatting while eating knockoff Twix (called “Twins”). I think her interest in talking to cyclists was able to override any disgust factor. 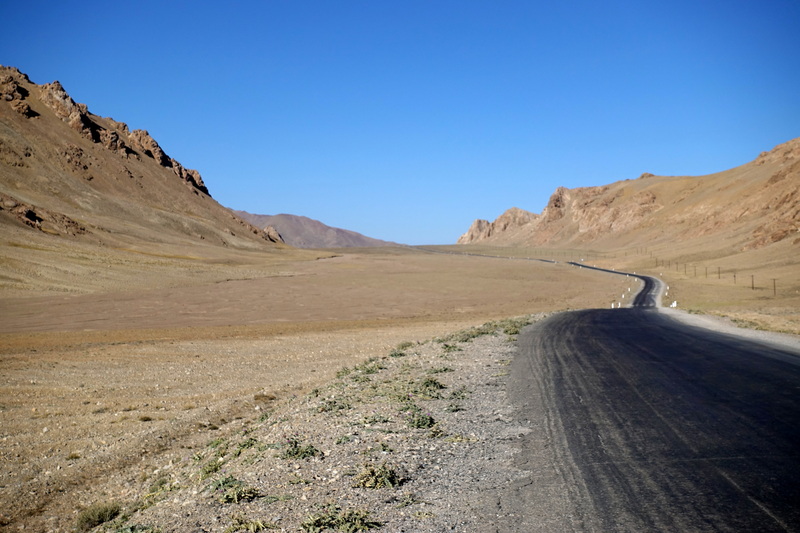 She seemed interested in countries we were going to go through, but as we were getting closer to Afghanistan, she told us to not go there, making the noise of a machine-gun – okay, we have been warned! Sorting myself out with our little helper. “Afghanistan, no good! Tac-tac-tac-tac-tac (gesture of a gun)…” Okay we’ve been warned! As I sorted myself out, she helped me find a nearby shop nearby to buy a Coke (the remedy for all of our ailments). Later, when we stopped for lunch at a bus stop, I was cautiously drinking my soda as woman approached to talk to us. When I told her that my stomach wasn’t feeling the greatest, she offered to have us stay at her sister’s, whom she was visiting. We gratefully responded ‘no thanks,’ but she returned later with her sister to give us some homemade kefir (which I wasn’t looking forward to slurping up with a belly full of Coke) and bread before we departed. 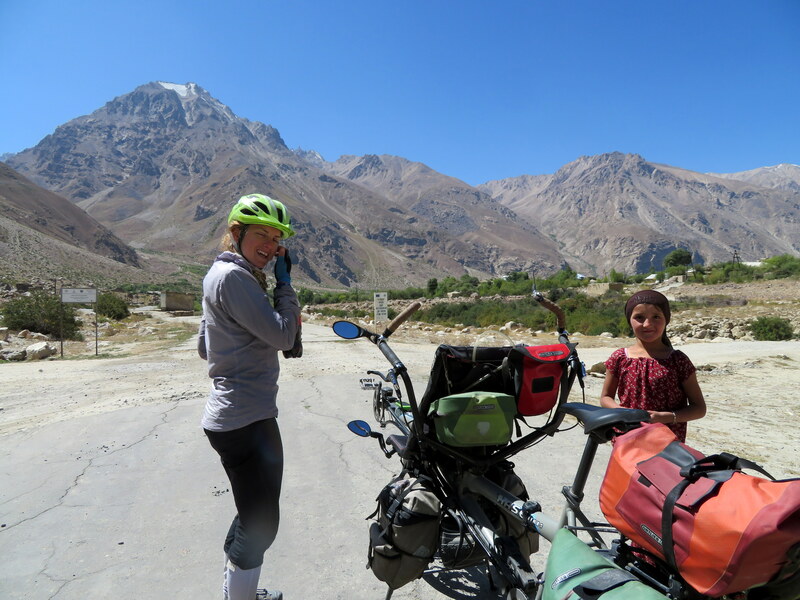 The rest of the day was a blur as we cycled down the mountainous valley and through green villages towards Khorog. 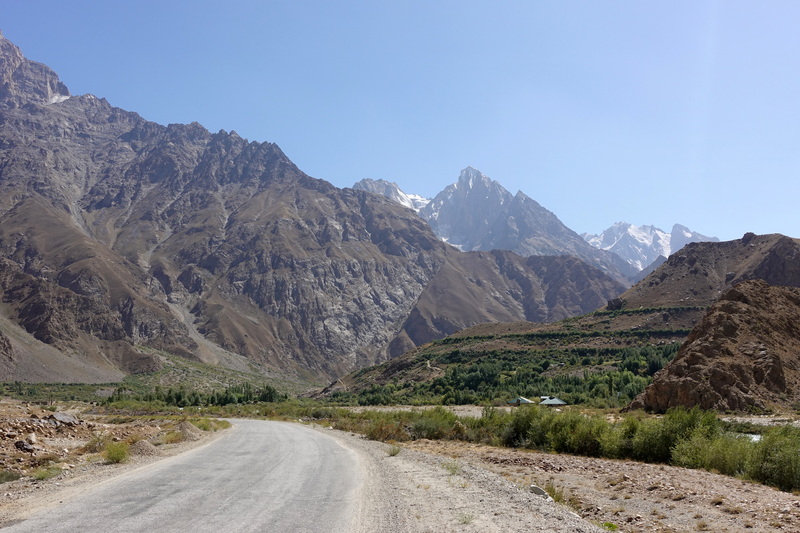 At one point, Cédric and I joked that this area was the Switzerland of Tajikistan because many of the homes seemed to be newly constructed and the yards were well manicured. 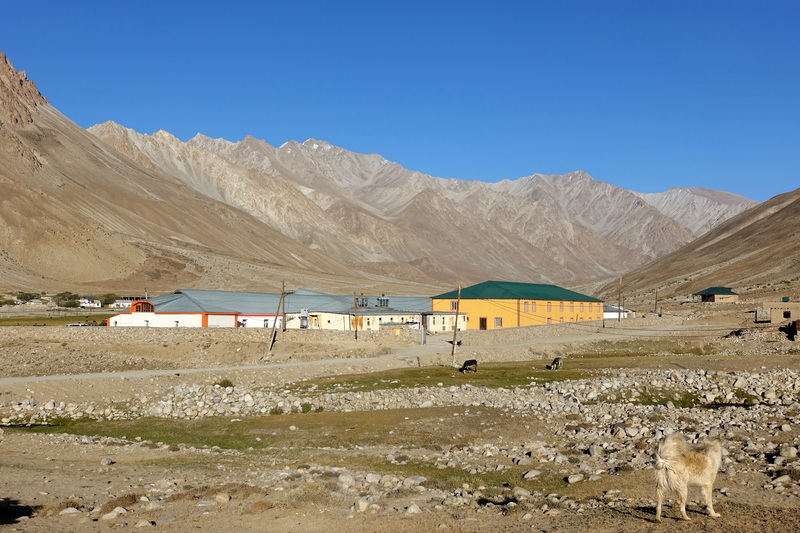 In the evening, just as the sun was setting behind the mountains, we rolled into Khorog and found a hotel before it got too dark. 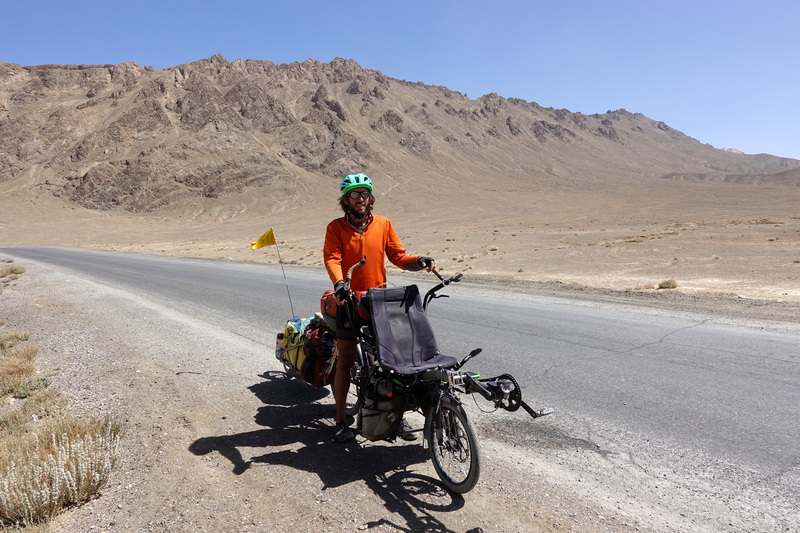 That day was supposed to be an easy downhill, but as everywhere else in Tajikistan, easy does not exist, and we had a total ascent of almost 1000m over the day, and a riding time of over 7h30 – one of the longest days. 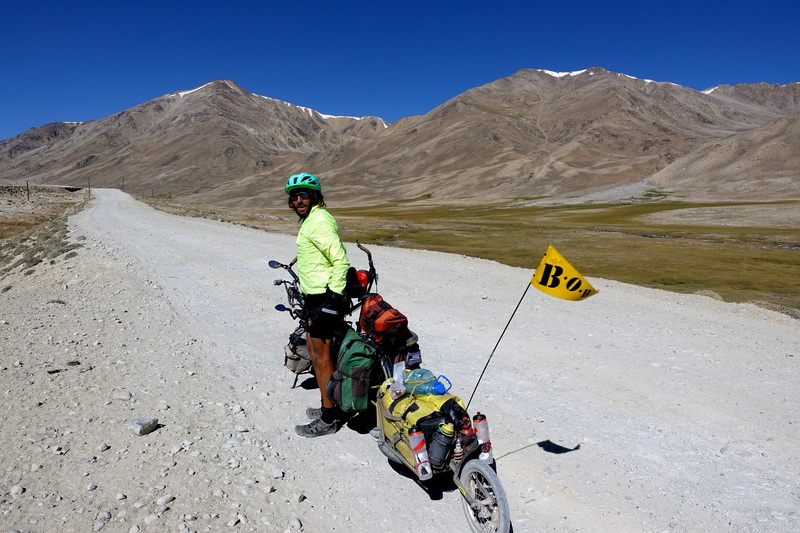 We were glad to have made to Khorog though and settle for two nights in a quiet, clean and comfy hotel. A small routing error on the GPS. 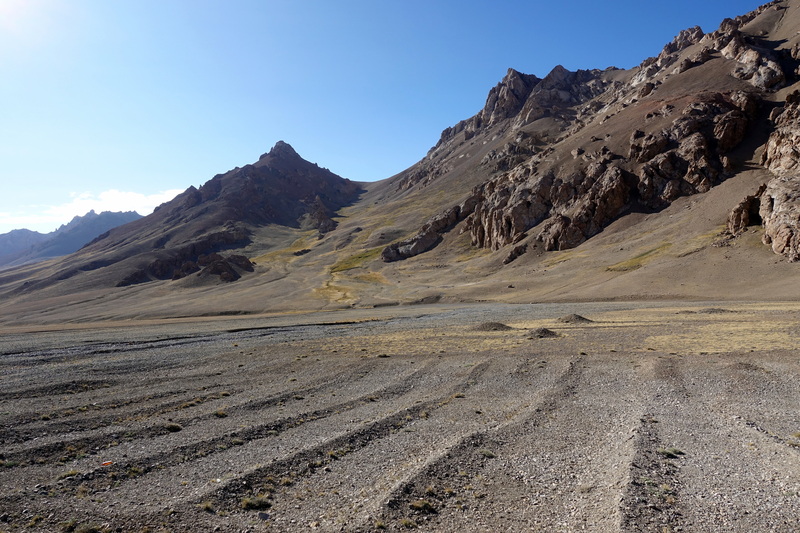 Tajikistan decided to build a new dam, but did not think that the road going in the middle of the valley would become a submarine-highway. Another celebratory pizza after an exhausting day. We usually eat local dishes…but there are some days where the choice goes towards pizza or Western fast food! Hehe, well we did see a few trees around Dushanbe and some orchards in Uzbekistan (lots of grapes, I guess that still counts as a tiny tree!). 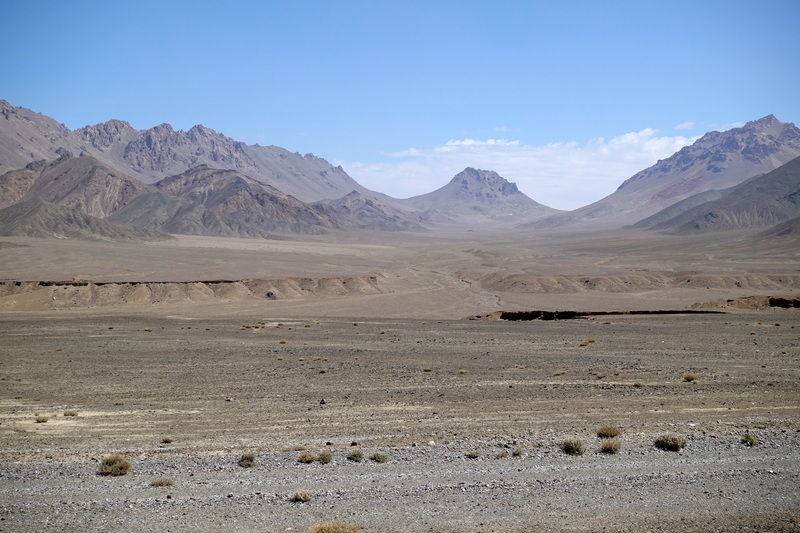 But now that we are getting deeper into Uzbekistan, it’s also becoming a desert…it looks like we won’t see a forest for another 2000km! Deep blue sky in those pics at 4000m+ definitely lets one know that they are closer to the edge of the atmosphere! You two appear to be ready to take on the challenge of biking on the lunar and Martian surfaces – – I should send a note to Elon Musk telling him about the two ‘cyclostronauts’, that are in great physical shape and ready to board a Space X and take on another new challenge! Cheers to the cyclostronauts! Yeah except that the reliability of the first launches at SpaceX is far from reaching their marketing skills! The reliability of Mr Musk is also not quite optimal (his stupid submarine in Thailand…). We’re fine staying on earth! 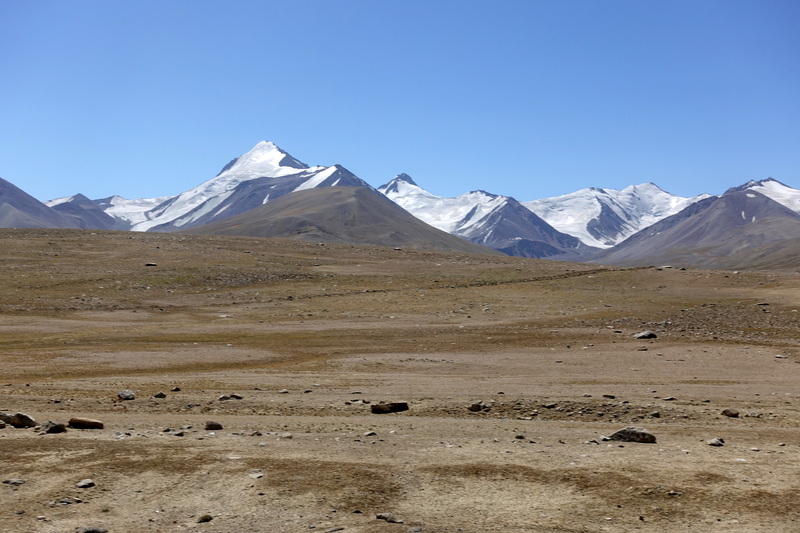 Also at 4600m, there’s half the amount of air compared with sea level (about 500hPa), so the atmosphere is a lot thinner over us, thus a darker blue. Space officially starts 96km higher (and the sky color is completely dark then).